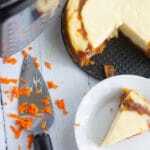 This Instant Pot Cake recipe combines moist Carrot Cake and Creamy Delicious Cheesecake all in one dish. Now you can have the best of both worlds with this cake recipe. 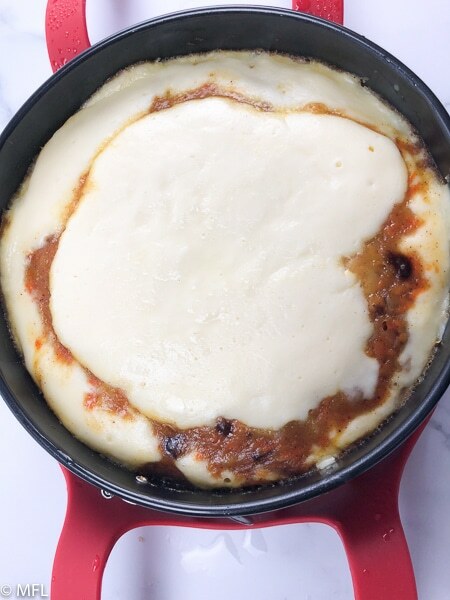 FULL RECIPE AND INSTRUCTIONS ARE AVAILABLE IN THE RECIPE CARD AT THE BOTTOM OF THE POST. YOU CAN FIND IMPORTANT TIPS/TRICKS IN THE BLOG POST. Happy Birthday to Me! I usually celebrate my birthday by going out to The Cheesecake Factory and having a wonderful dinner followed by a delicious slice of cheesecake. If you’ve ever been to the Cheesecake Factory, then you know that they have tons of cheesecakes on their menu. 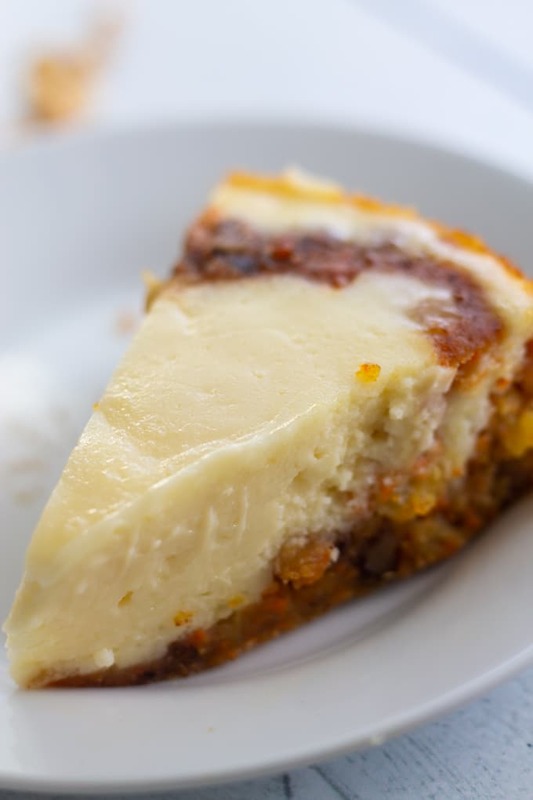 My favorite cheesecake on the menu is the Carrot Cake Cheesecake. 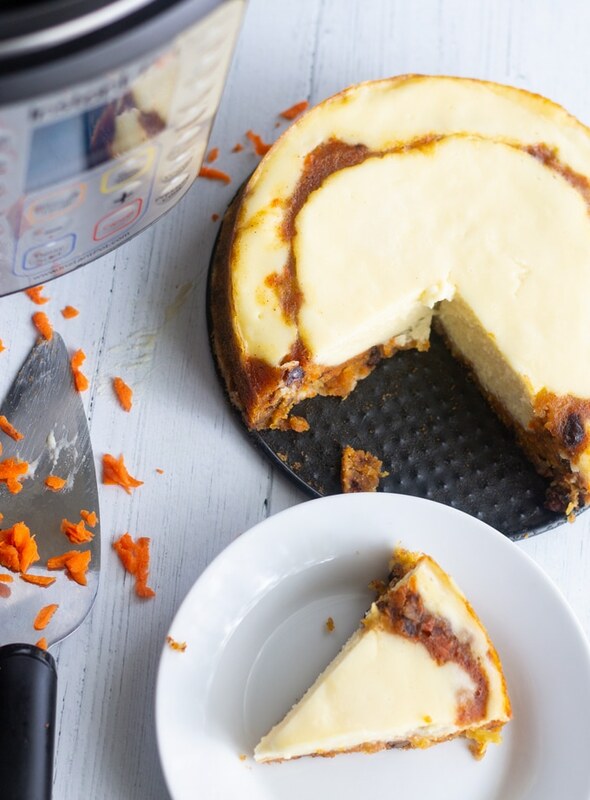 It’s moist carrot cake combined with delicious creamy cheesecake. It’s the best of both worlds! I started to make this cake at home a few years ago and I would typically use the oven. 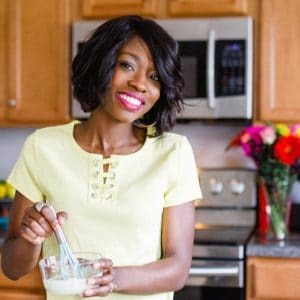 Now I use my Instant Pot Pressure Cooker because I love it so much. When making a cake in your Instant Pot, you’re going to use a trivet or baking sling and pour your liquid in the bottom of the Instant Pot. It’s perfect for cakes that you want to keep moist. Some brands of the Instant Pot have a cake setting for “baking” a cake. I tend to ignore the many fancy settings and stick with Manual or Pressure Cook setting. You’ll want to cook this cake for 35 minutes of high pressure.Once your timer is up, let it natural release for 10 minutes and then release the remaining pressure. If you have a 6QT Instant Pot, like I do, you will need a smaller pan to fit inside the instant pot. I use a 7-inch springform pan from this kit. 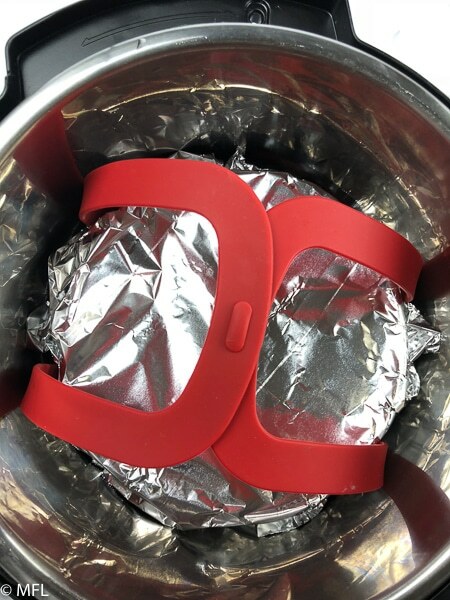 I also use a silicone bakeware sling to lower my cake pan into the Instant Pot. A foil sling could work as well but I decided to invest in this silicone sling and I’m so glad I did. Makes putting bakeware in and out of my Instant Pot so much easier. If you choose to go the foil sling route, you can learn more about creating a foil sling here. Make sure all ingredients are room temperature prior to getting started. That’s the #1 rule in baking cakes and cheesecakes. Allow cheesecake to cool on counter for atleast 30 minutes before placing it into fridge for refrigeration. Refrigerate for at least 2 hours, although overnight is best. Cover cake pan with foil before pressure cooking. That will help keep liquid off the top of your cheesecake. If liquid still gets on your cheesecake it will be perfectly fine. When layering this cake, make sure to start with the carrot cake layer first. That will act as your base for your cake. Make sure your top layer is the cream cheese batter. If you’re looking for more Instant Pot Desserts, try this instant pot bread pudding or this round up of dessert recipes for your Instant Pot. 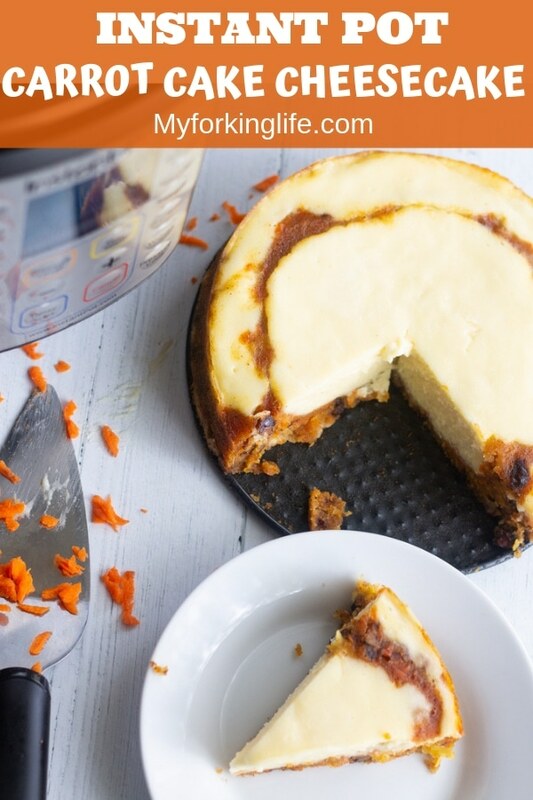 Get the best of both worlds with delicious moist carrot cake and cheesecake made in your Instant Pot Pressure Cooker. Grease a 7 inch springform pan, set aside. 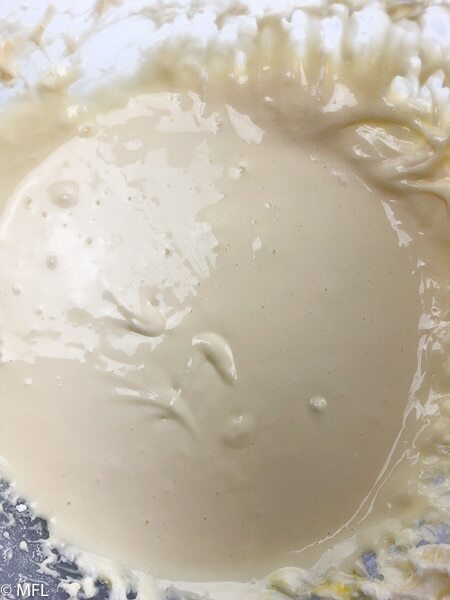 Prepare cheesecake batter by placing cream cheese, sugar, sour cream, and flour in a medium sized bowl. Use a hand mixer and beat on medium speed until smooth. Then add your egg and vanilla and continue beating until blended. Set aside. Prepare cake batter by placing vegetable oil and sugar in a separate medium bowl. Use a hand mixer and beat on medium speed until blended. Add flour, baking soda, cinnamon, nutmeg, and salt, egg, and vanilla extract. Beat on medium speed until well blended. 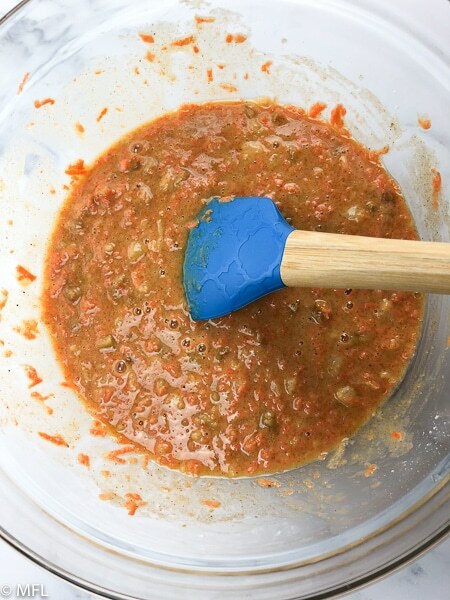 Add carrots, pineapple, and walnuts to bowl and fold into batter by mixing with a spatula. 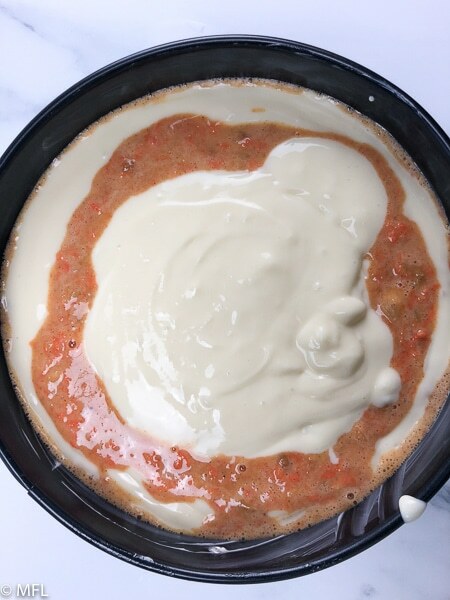 Pour about half of the the carrot cake mixture into the bottom of your greased springform pan, spreading it out so it covers the bottom of the pan. Then add cream cheese batter in the middle of the carrot cake batter. Lightly spread the cream cheese mixture over the cake mixture. Repeat these steps until all batter is in the springform pan, finishing with cream cheese layer on top. Cover springform pan with foil paper. Add 1 cup of water to Instant Pot. Add cake to Instant Pot on trivet or bakeware sling. Cook on high pressure for 35 minutes, allow to natural release for 10 minutes. Make sure all your ingredients are at room temperature before beginning. This ensures that your cheesecake isn't lumpy. You can use this method in any electric pressure cooker, no need for a special cake button. Use a handmixer and beat cream cheese, sugar, flour, sour cream on medium speed until combined. Add egg and vanilla and beat until incorporated. In a separate bowl, combine vegetable oil and sugar and mix with beater until combined. Add flour, baking soda, egg, and vanilla extract. Mix again until combined. With a rubber spatula, fold in carrots, pineapple, and walnuts. Layer the mixtures in a greased 7 inch spring form pan. First add the carrot cake mixture and spread over the entire bottom of the pan. Then add a little bit of the cream cheese mixture. Then more carrot cake, and finish with a layer of chream cheese mixture at the top. Add 1 cup of water into Instant Pot. Place cake covered with foil on trivet or bakeware sling. Cook on high pressure for 35 minutes, natural release 10 minutes, then release remaining pressure. Once you remove your cake and uncover it, it will look like this. Allow it to cool on your counter for about 30 minutes. Once it’s cooled on the counter for a bit, put cheesecake in your fridge and refrigerate for at least 2 hours. If you can, refrigerate it overnight, that would be best. *Notice how the cake has pulled away from the sides of the pan. It makes removing the spring form easy. It shouldn’t. It will rise a little but not enough to go above the top of the springform pan. Tried this in a 7″ springform pan as directed, but even after the 10 minute NPR it was batter in the middle. Would increasing the time to 40 minutes rather than 35 minutes help next time? I salvaged it in the oven this time. I have a 6qt Lux. Hi Lynda, yes, increasing the time by 5 minutes should help for the next time. This looks delicious! I have an 8 qt IP. What adjustments should I make, if any? Hi C Kurtz, I don’t own an 8 qt so I couldn’t tell you with 100% accuracy. However, my suggestions are I’d increase the water in the bottom to 2 cups if using the 8qt and keep the timing the same. If it’s not done, I’d pop it back in for 5 minutes more. Hi! I really want to try this recipe for Valentine’s day. My husband’s favorite is carrot cake. I was hoping to make a really small heart shaped cake. The pan is 4x4in and 1 3/4in deep. Do you have any tips for adjusting the cook time for a tiny cake? Thank you! That’s so awesome and a great idea. I’ve never made the cake in a smaller pan. However, if you decrease the cook time and it’s not finished, you can increase the cooking time until it’s set in the middle. Trying it right now it’s in the instant pot was very easy to make will let you know how it tastes tomarrow. Hi! I’m so excited to try this recipe for Thanksgiving but I totally forgot the crushed pineapple. Is there something I could substitute? Hi Krystal, I’ve only made it with the crushed pineapple but I’d suggest leaving them out or adding raisins instead. Hi Ruthellen, my only guess may be if you live in a higher altitude. You would have to add a few minutes to the cooktime to accomodate for that. After 30 minutes, your cheesecake should be mostly set with a little jiggle in the middle. It sounds like that’s what you eventually got. That time in the fridge should finish the setting of the cheesecake. 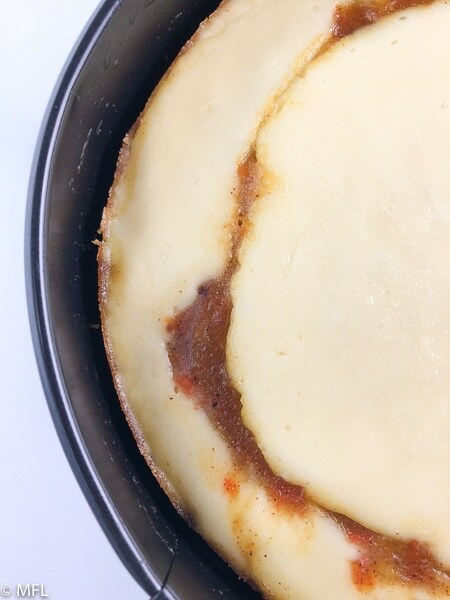 I did receive one review on Facebook where a user did need an additional 10 minutes as well but her cheesecake still turned out great, so yours should be fine as well. Keeping my fingers crossed that it’ll be fine when I cut into it! The batter tasted delicious. I’ll comment after I serve it.